Even if you were a great kitchen organizer before going Paleo, dramatically changing your diet can be an organizational challenge: say goodbye to easy-to-store staples like pasta and rice and hello to multi-pound hunks of meat that you have to worry about defrosting on time. If you weren’t terribly organized in your Pre-Paleo days, it can be even harder – what the heck is anyone supposed to do with all these vegetables? 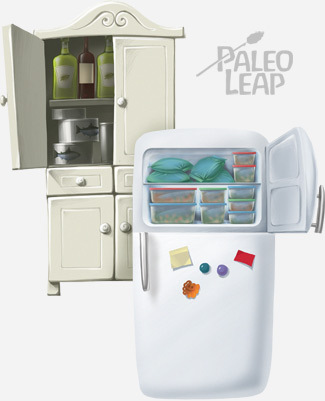 Here are 7 simple organizational tips specifically for Paleo kitchens and the challenges that Paleo food can bring. A defrost container can be any random bowl, or not even a bowl at all (that one piece of Tupperware that lost its lid years ago is perfectly fine). The point is just to have a designated receptacle for defrosting meat in your fridge. The obvious benefit of this is that it keeps any leaks and drips out of the rest of your food. But an even bigger advantage is the way it gets you into a regular cycle of defrosting things to cook. If you get into a habit of refilling that bowl when you take something out of it, you won’t ever have to decide between waiting until 11pm for dinner and trying to cook a chicken while it’s still half-frozen. Having a steady supply of freshly-defrosted meat = dinner is easier to make = less temptation to skip the protein or dive into the junk food. Where do you keep your spices? If they’re in a cupboard up above your head, chances are excellent that you have to spend too much time every time you cook fumbling around for the one you want, because it’s all just a jumble of bottles and bags that got shoved in there haphazardly. Putting your spices at or below eye level makes it easier to see what you want, and also much less challenging to go through and organize them sometimes to avoid a jumbled mess. You’re not craning your neck and crawling up onto the countertop, and you can see what you’re doing. Use a spice rack (spinning or otherwise), a drawer at waist height (with labels on the lids – it makes everything so easy to grab! ), or any other organizational system you like. But put it where you can see everything. The easier it is to use your spices, the more you’ll end up using them, the more delicious your food will be, and the less effort it will take to eat homemade meals instead of going out. If you’re switching to Paleo from a diet of processed foods, cafeteria foods, or even standard “healthy” foods, you may be shocked at how many storage containers you end up using. Replacing a granola bar for breakfast with a week of pre-cooked egg dishes? You’re going to need an extra container or three. Packing lunch every day when you used to eat out? You’ll want at least an extra two – or five, if you pack your lunches all at once at the beginning of the week. 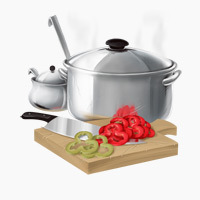 Saving time by cooking in bulk? Say hello to your new fridge full of Tupperware! Buy more than you think you’ll need, and pay for ones that really work. It’ll be worth it when your lunch doesn’t leak all over your laptop on your commute. And get containers that you find easy to use. If you find it inconvenient or bulky to store things in Mason jars, then forget about Mason jars and use unfashionable but functional containers that make your life easier. To store them, get containers that stack nicely, and keep a separate part of your storage area just for the lids, so they aren’t clogging up the main stack of containers. Kitchens tend to accumulate stuff – a gadget here, a gadget there, and suddenly the drawers are overflowing. This makes it hard to find what you actually want, so cooking devolves into a hunt for things and ends up taking way longer than it should. If you don’t own it, you don’t need to find space for it, clean it, wash it, disassemble it, reassemble it, or move it out of the way while looking for other things. Paleo cooking doesn’t require much in the way of special equipment. Unless you’ve basically never cooked before, there’s almost certainly something you can throw out. Solid, well-made basics will get you much further than a whole drawer of avocado savers, citrus juicers, egg poachers, cherry pitters, and whatever else you got as stocking stuffers five years ago. Go through your drawers with a big cardboard box and throw in everything you can’t remember using in the past month. Leave the box on an inconvenient shelf. If you need something from the box, take it out and put it back in the drawer when you’re done. After a year, donate whatever you haven’t taken out to Goodwill without even opening it again, because you clearly don’t use it. Paleo cooking takes planning. It doesn’t always have to be a full-on meal plan, but unless you want to spend your whole life running back and forth to the grocery store, at least some planning is pretty much mandatory. Even if you have your whole life on your computer and your phone, it’s helpful to have a non-electronic writing surface permanently attached to the kitchen for those times when you remember something while your hands are wet, or when the computer is in another room, or when you just don’t feel like pulling out your phone and dealing with the tiny little keyboard. One big challenge of Paleo cooking is dealing with all that fresh produce – with your fridge packed full of vegetables, fruits, and fresh herbs, it’s very easy to lose track of stuff and then discover it a week later, rotting away. There are all kinds of ways to address this problem. You could just buy a few days’ worth of produce at a time, so you can always keep track of what you have. You could make a very strict meal plan, so you know you’ll use everything in time. Or you could organize your fridge to solve the problem for you. When you unpack your groceries, put in the least perishable stuff first, so it gets pushed to the back. Then put the most perishable things towards the front and top of your refrigerator. Lettuce to the front; cabbage to the back. Cilantro to the front; rutabagas to the back. That way, every time you open the fridge, you’ll see the things you need to use first. It’s hard to lose track of them when they’re right under your nose! 80% of canned soups, sauces, etc. Your kitchen is probably designed on the assumption that you’ll need all of those things, with storage space to match. Some of them will get replaced by Paleo alternatives, but there’s still a lot of space freed up. Use it to store small electronics, like blenders, slow-cookers, spiralizers, pressure cookers, etc. This gets them all off the countertop so they don’t clutter your work area, but keeps them in easy reach for when you do want them. Now it’s your turn! Take a picture of your favorite part of your kitchen (or all of it, if you’re really in love) and share it on Facebook or Twitter. What are your favorite organization tips? Any seasoned Paleo wisdom to share?